Something crashed into me from behind in Lambda, where the big shark ships close in and restrict space. I think I fired off my Captain-powered Alpha Beam a little too early, otherwise I could have got past safely. Replay verified if anyone's interested. Need to improve my strategies for Lambda before I can make inroads to a much higher target of 25mil. Currently making 13mil tops after fourfold-countering Fire Fossil, and maybe a little more after improving the run. Looks like the Omicron route and Great Thing will have to wait for a bit longer. Hey Icarus, could you put up one of those replays? I've never found any good G-darius plays online, and super-play.co.uk has none. I'd like to see how a good player plays this game. 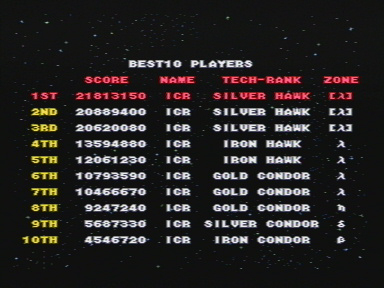 Plus I'm about 9mil shy of the WR (31mil) and am trying to get about 25mil tops from a no-miss run. Doubt I'll get any more than that, unless something miraculous happens. 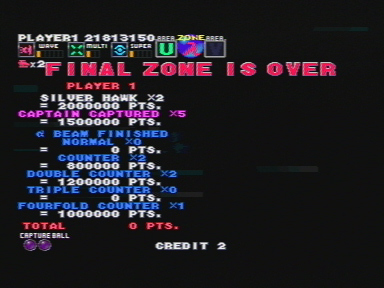 I'll encode this 21.8mil run while I sleep, and upload it for you in the afternoon. I just upped a stage1 replay up on YouTube as well, its processing now and should be available shortly. I'll post both links when they are ready. Not to steal Icarus's thunder, but no one's put up the one from Jigsawman's old FTP on Superplay? Guess I'll have to. 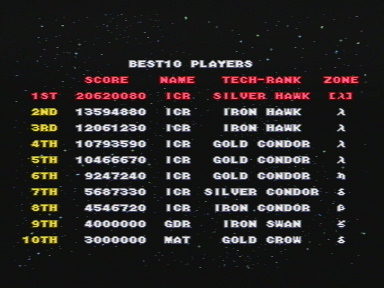 55 million on an Omicron route, using one of the arcade versions. Right before Fire Fossil got ready to launch its Beta beam, which would have led to an opportunity for a Fourfold Counter. Died earlier this time- would probably have been over 9M if I had gotten to the boss. I'll be back on this eventually, I want that 25mil Lambda ALL done. Sorry about that. Next time send me a smack upside the head via PM. 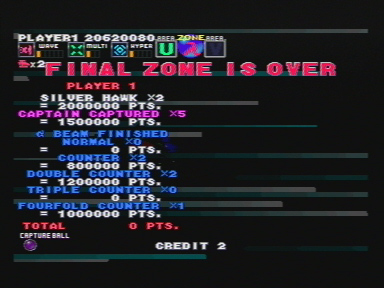 I've done 2.6M for Area B, though I'd still say Icarus did a little better in his replay for the first zone. The Captain Capture bonus for this would be 300,000 more onto the end game total- so we're nearly even on score, but he has five capture balls left (I finish with 3). Looks like Area A may be the better one for score-capture ball ratio. One interesting trick for some moments of invincibility (or protecting a captured Captain) in HARUKA's replay is the Fake Alpha Beam, where you temporarily absorb an enemy but release the button instead of holding to complete the charge. The PS2 G. Darius seems to have less slowdown, maybe even compared to the PCB Ver 2.03J (I assume that's the one in the HARUKA vid). You can get over 3mil for both Alpha A and B if you expend all your Capture Balls. However I do not recommend it at all, as those Capture Balls are far more important for the later stages where scoring opportunities are more frequent. The technique in my 2.3mil Alpha-A vid is a variation of HARUKA's overall technique for conserving Capture Balls while scoring over 2mil for the stage. His method of dealing with Eclipse Eye - using the Captain's missiles to destroy one eye and cheek part, while weakening the other eye and cheek for the counter beam - is very difficult as it requires very controlled bursts of fire, something the PSX and probably PS2 ports don't have. One tip I'll give you is to learn the location of all of the high scoring formations in each stage - high scoring is 10k or higher for the formation - and work them into an Alpha Beam routine. Unlike your Shot, your Alpha Beam has a half-second extra leeway in destroying enemies, meaning you can let something go off the right side of the screen for at least half a second and still destroy it with a Beam. Use this to your advantage in timing attacks, you see HARUKA use it quite liberally. Yup. In places where protecting the Captain is required to score high - such as both Queen and Fire Fossil - beam cancelling helps to preserve the Captain's hitpoints. On the slowdown-plagued PSX version it is much harder to do (otherwise I'd be using it during Fire Fossil) but it might be easier to do on the PS2 version. The PS2 version, from what I hear, is very close to the original hardware. Meaning no slowdown at all. Which is great. Border Down- there's one I need to get back on sometime. A great time in Alpha-B for a charge beam is right as you're coming up from the water. Once I kill off the last formation under the ocean surface, I start charging. A group of those hanging mine things fall, perfectly lined up. When the first one hits the water, I have a Alpha beam ready to trash these things. Not too long after this comes a formation good for 30K x 4. I'll AB the final 2 formations of large ships here as well- a double 30K x 4 is hard to resist, plus doing so clears them out and makes it easy to snag the final Capture Ball in the stage before the WARNING scene. On the boss, I save the eye to blow off with the Counter Beam along with that rotary-blade thing. Roughly a million comes from the boss. Counter finishing Dual Horn is no problem (and last time, I nearly had a Fire Fossil 4-fold counter finish), but sometimes I have the beam peter out on Tripod Sardine. Does that blue plasma ball drain your Alpha Beam? It seems that way to me. ...but sometimes I have the beam peter out on Tripod Sardine. Does that blue plasma ball drain your Alpha Beam? It seems that way to me. No it just obstructs it. The only way to destroy Tripod Sardine with the Alpha Beam is to try and sneak the beam under or over the ball. Fire Fossil just got grilled with a Fourfold Counter. Reached Lightning Coronatus this time. If no ships were lost, I probably could have ended this one with something close to 20M. Sorry, was a while ago. I think I went up then down down! Sorry for misunderstading, forgot to turn on second versions of bosses on previous score! Haven't played this in a while, figured I'd give it a whirl. Lo and behold, I beat my personal record on my first try. R-Type seems to be good practice for this game. I stayed over at a friend's last night, and he has a PS2 and G-Darius (for PS) that I ended up introducing myself to while he played Counter-Strike on his PC. I like all the fishies. ... Except for Queen Fossil. Thanks for the FAQ, ZK! I'm going to read up and be prepared next time that I get to play this. Is it alright to post it, even if it's not enough to change my position? I was able to play this again last night, and I tried really hard (well "pretty hard") to play well enough to get a higher placing. I thought that I needed 6 M, and when I got it I was pretty pleased, but then I checked and saw that I needed a third more than that. Still, I experimented with scoring and strategy and had a good time. I actually got to the third stage boss on one life, but given my skill level, I was like "this is pretty uncalled-for" around (I'm guessing) the middle of the boss's attacks. Fun though! No stage four this time, but definitely next time, which should be soon. Is it alright to post it, even if it's not enough to change my position? I did that in the Blazing Lazers thread recently so it's not like I'm in any position to complain. In my score threads you can safely assume I have no issues with autofire unless I specify otherwise.